Pogonia ophioglossoides is one of the many native North American orchids, for which we are studying the mycorrhizal fungi they rely on to grow. Isotria medeloides is one of North America's rarest orchids. 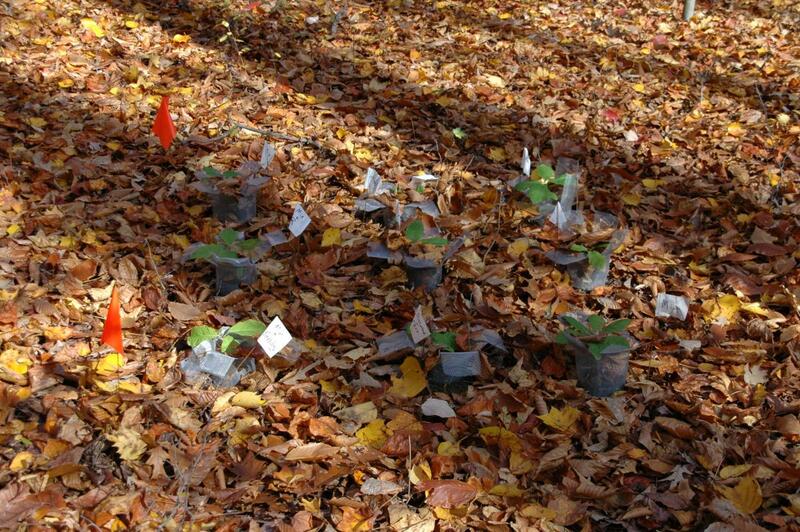 We are working to understand how its population dynamics are affected by the abundance of its mycorrhizal fungi. Sometimes it isn't easy to get to the marsh to study the Phragmites! Phragmites australis is an invasive wetland grass, whose mechanisms of spread we have come to understand using patterns of genetic variation. Cypripedium, the lady's slipper orchids, is a large genus that includes some of the most charismatic terrestrial orchids. Research in the molecular ecology lab uses a combination of field and laboratory experiments and various techniques to address questions about symbiotic associations and plant ecology.Two overarching questions form the core of our research: How do symbioses determine community function and diversity? What factors govern the spread and implications of invasion by non-native species? To answer the first, we are examining orchids and their symbiotic interactions with mycorrhizal fungi. To answer the second, we are looking at nonnative earthworms and the invasive wetland grass Phragmites australis. Sampling orchid roots to identify and culture the fungi they need to grow. How do symbioses determine community function and diversity? Orchids and their mycorrhizal fungi (which they need to germinate and grow) give us an ideal model to explore questions about symbiosis in the plant world. We are examining the effects of environmental conditions and the abundance of mycorrhizal fungi as drivers of orchid distribution and flowering. We are also applying these results to increase the success of orchid conservation. 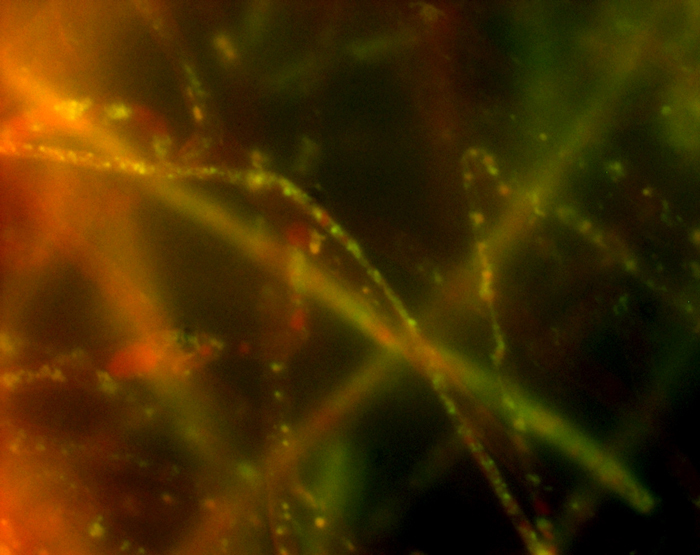 Bacteria living within the hyphae of orchid mycorrhizal fungi glow green when stained. We are also working to understand the function of bacteria that live within the orchid mycorrhizal fungi, the fungal microbiome. 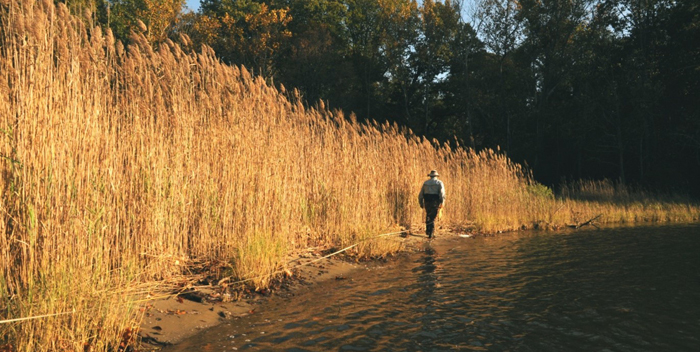 Dennis Whigham measures the length of a patch of Phragmites australis along a shoreline. What factors govern the spread of non-native invasive species? How do human activities affect the spread of invasive species? We are using microsatellite analysis to understand why the invasive grass Phragmites australis is now spreading so quickly in estuaries of the Chesapeake Bay and how its spread relates to anthropogenic effects. Tree seedlings are planted in mesh bags to understand how they are affected by non-native earthworms. What effects do nonnative species have on community and ecosystem functions? We are examining how nonnative earthworms are affecting carbon sequestration and plant community composition. 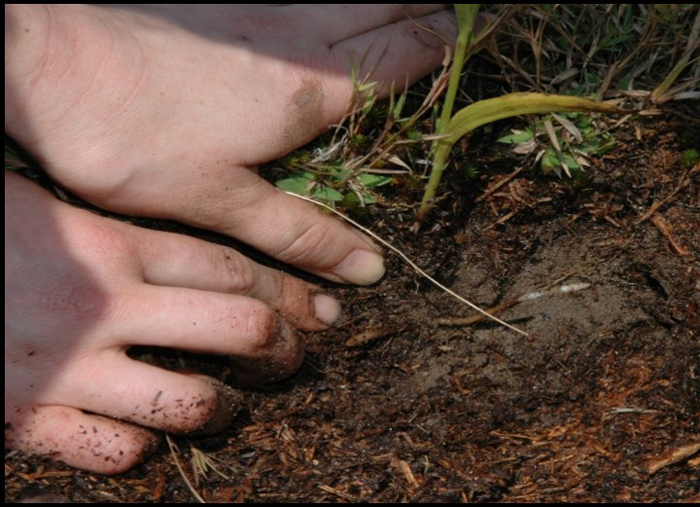 Specifically, in these projects we are investigating how nonnative earthworms impact the forms of carbon stored in the soil, and how they impact plant communities by changing the composition and abundance of mycorrhizal fungi in the soil. Deep fissures in the banks of saltmarsh can allow the bank to break away when the marsh is exposed to eutrophic conditions. How do native species respond to anthropogenically altered environments? 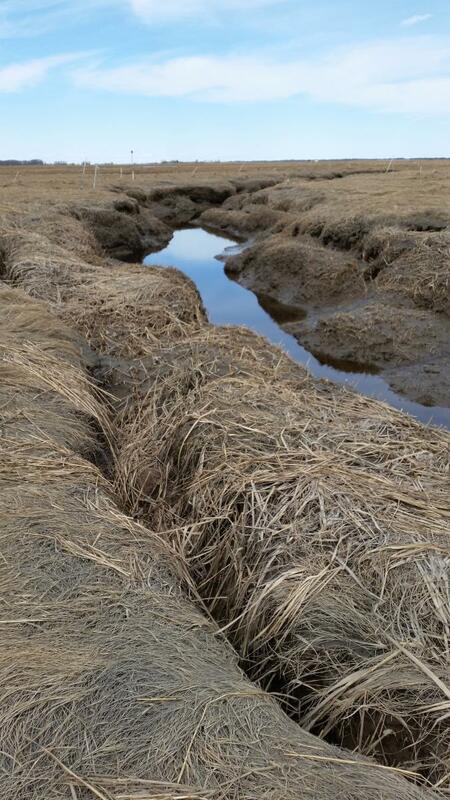 We are studying the effect of long-term saltmarsh eutrophication on the foundation plant Spartina alterniflora. Smooth cordgrass is critically important for holding saltmarsh sediments together. We are using patterns of genetic variation to understand how eutrophication favors varieties of smooth cordgrass that are not as good at holding marsh sediments together and so favors marsh collapse. With the altered wildfire regimes that come along with human settlement, prescribed burns are increasingly used to promote conservation of fire-adapted species and to manage wildfire risk. 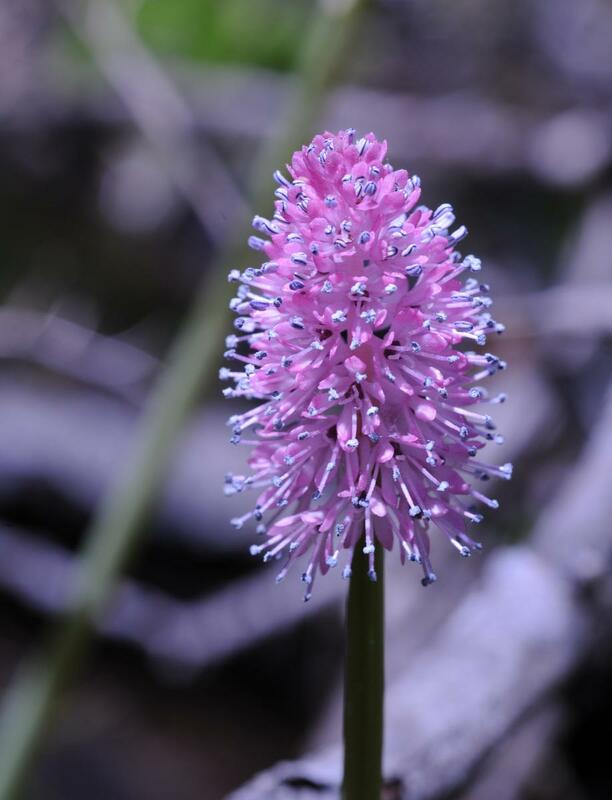 We are also studying how prescribed burning affects the federally threatened swamp pink, Helonias bullata.